October 2017 | TOMMY JOHNSON, Jr.
LAS VEGAS (Oct. 29, 2017) – After their second round loss on Sunday at The Strip at Las Vegas Motor Speedway, Terry and Doug Chandler’s Make-A-Wish Funny Car team with Tommy Johnson Jr. look toward closing the season with a win and getting ready for the 2018 NHRA Mello Yello Series season. When Johnson lost to Don Schumacher Racing teammate Jack Beckman that mathematically eliminated him from contending for the championship in two weeks at the season-finale at Pomona, Calif.
Johnson and the team were championship runners-up last year and finished third the two previous seasons. The late Terry Chandler was the financial backer of the Make-A-Wish team as well as the Infinite Hero Foundation Dodge driven by Beckman. Chandler died on July 4 after a valiant battle with cancer, and her husband Doug has taken over funding the teams. Johnson defeated nitro rookie and former Alcohol Funny Car world champion Jonnie Lindberg in the opening session on Sunday. Don Schumacher Racing, headquartered in Brownsburg, Ind., fields seven professional NHRA teams. In Top Fuel, the U.S. Army dragster driven by eight-time world champion Tony Schumacher, the Matco Tools dragster driven by three-time world champion Antron Brown and the Papa John’s Pizza/Mopar Top Fuel dragster driven by Leah Pritchett; and in Funny Car, 2016 world champion Ron Capps in the NAPA AUTO PARTS Dodge Charger R/T; 2011 and 2014 world champion Matt Hagan in the 80th anniversary Mopar/ Express Lane Dodge Charger R/T, and 2012 NHRA world champion Jack Beckman in the Infinite Hero Foundation Dodge and the Make-A-Wish Dodge driven by Tommy Johnson Jr., both of which are funded by the late Terry Chandler. DSR has won 317 NHRA national event titles and 16 world championships. Follow Don Schumacher Racing at ShoeRacing.com, on Twitter at @shoeracing and Facebook.com/shoeracing. BROWNSBURG, Ind. 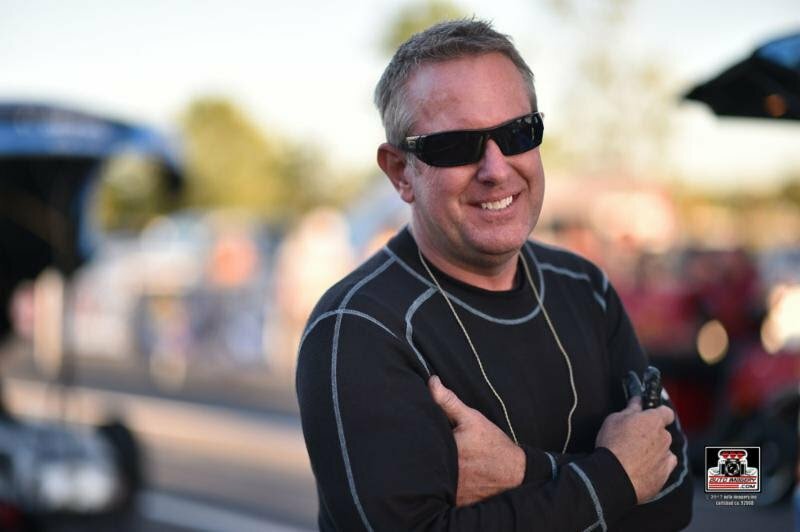 (Oct. 25, 2017) – With the 2017 NHRA Mello Yello Drag Racing series concluding in less than a month, Tommy Johnson Jr. and Terry and Doug Chandler’s Make-A-Wish Funny Car team set their focus on finishing the season strong. “We’ve struggled a little bit lately and hopefully this is where we can turn the corner,” said Johnson who currently is seventh in the NHRA points standings. He finished third in both 2014 and 2015 and was second in 2016. 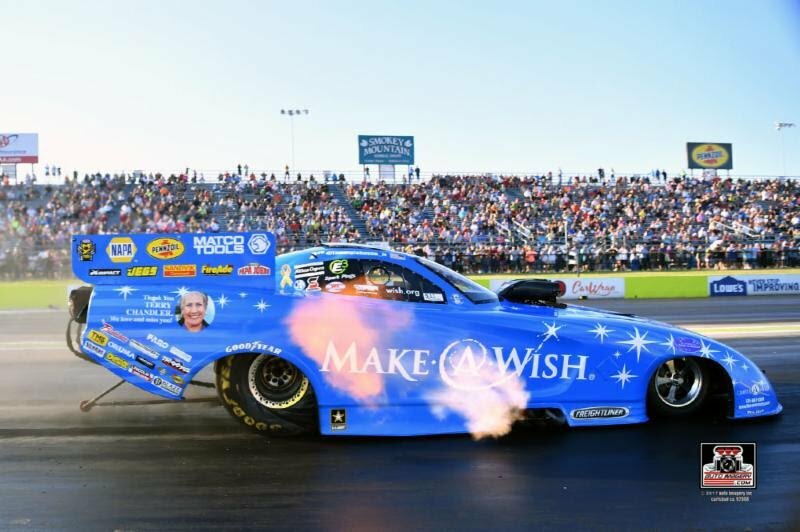 Johnson and the Make-A-Wish team led by crew chief John Collins with assistant Rip Reynolds, stayed very consistent throughout the regular NHRA season, advancing to four of five final rounds during July and August. Their Countdown to the Championship playoff efforts have been less than stellar with only two quarterfinal appearances. Johnson’s win in Funny Car in April was Don Schumacher Racing’s 299th and it was followed that weekend by Top Fuel teammate Antron Brown earning DSR its 300th. This weekend’s 17th annual NHRA Nationals at The Strip at Las Vegas Motor Speedway is the penultimate event of the 2017 season. “We’re going to do some testing on Monday at Vegas and begin working toward next year’s program. Antron Brown clinched his last two world championships for Don Schumacher Racing at Las Vegas and was able to celebrate two weeks later at the Pomona finale in Southern California. That won’t happen for Brown or any other driver in the nitro categories this year, largely because NHRA enhanced the points value for the season-ending NHRA Finals by about 150 percent. At Las Vegas this weekend, like 22 of the previous 23 events in the Mello Yello Drag Racing Series, the most a driver can earn with a perfect weekend is 130 points; at Pomona, 191 can be earned. No Top Fuel or Funny Car driver can leave Las Vegas with a 192-point lead and clinch a championship, and any driver 192 or more points out of first after Sunday’s final round at Las Vegas will be eliminated from contention. The seven DSR drivers and 19 of the 20 in the Countdown remain alive in championship contention but most are likely to be mathematically eliminated after Las Vegas. 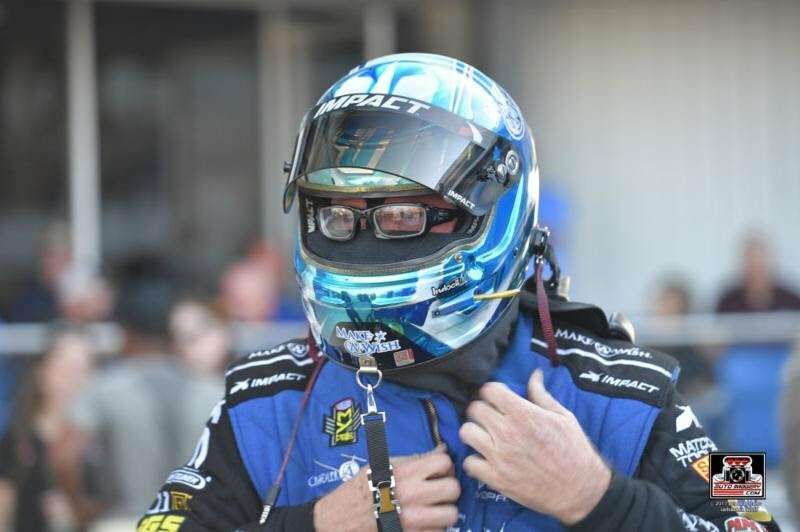 In Funny Car, DSR’s Ron Capps (NAPA AUTO PARTS) is atop the standings but just 24 points ahead of hard-charging Robert Hight of John Force Racing. The drivers each have won twice through the first four Countdown playoff races. Jack Beckman (Infinite Hero) is fourth, 186 back while Matt Hagan (Pennzoil/Mopar) is fifth (-226) and Tommy Johnson Jr. (Make-A-Wish) is seventh (-271). In Top Fuel, Steve Torrence leads Brittany Force and Doug Kalitta by 57 and 76 points, with DSR’s three-time world champion Antron Brown, winner of the last two championships for Matco Tools, ranked fourth and 105 behind Torrence. Leah Pritchett (Pennzoil) is fifth (-180) and eight-time world champ Tony Schumacher is sixth (-192). DSR has won 316 NHRA national event titles and 16 world championships. ENNIS, Texas (Oct. 15, 2017) – An early exit at the 32nd annual NHRA FallNationals sets Tommy Johnson Jr.’s sights on the upcoming 2018 season. During the opening session of competition on Sunday, Johnson lined up Terry and Doug Chandler’s Make-A-Wish Dodge Charger R/T against 16-time world champion John Force. The two nitro cars battled down the track in puffs of smoke with each lost traction but Force got the smoking win light with a 4.413-second lap at 234.61 mph to beat Johnson’s 4.467 (192.44). “It was just a weird first round, a lot of people were having issues and we were going right down there and then came loose,” Johnson said of the messy first round resulting in many drivers smoking their tires. The NHRA will have a weekend off before traveling to Las Vegas for penultimate event of 2017. Johnson and the team, led by crew chief John Collins and assistant Rip Reynolds, won the spring event in Las Vegas but has yet to visit a winner’s circle since. BROWNSBURG, Ind. 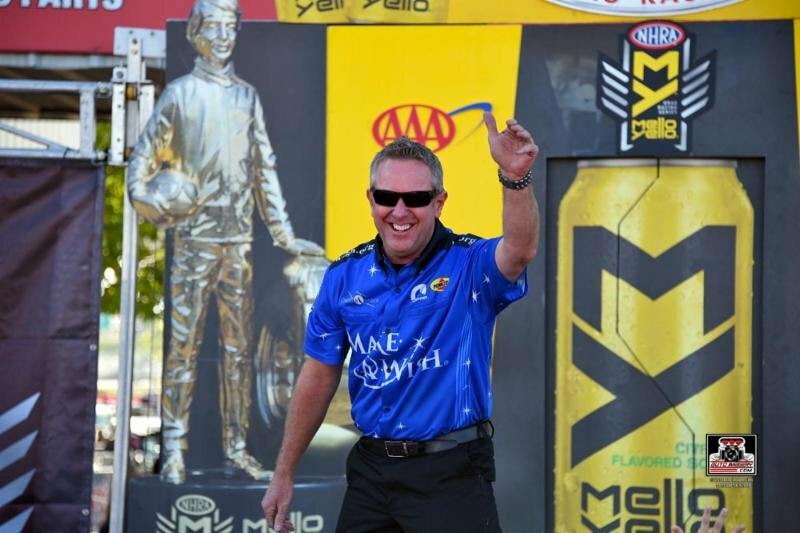 (Oct. 11, 2017) – With only three events of the 2017 NHRA Mello Yello Season remaining, Tommy Johnson Jr. stays hopeful that Terry and Doug Chandler’s Make-A-Wish Funny Car team can win the NHRA championship. “Realistically, we have to win the next three races to have a shot at the Championship,” Johnson said. The Chandler’s Make-A-Wish team sits No. 7 in the NHRA points and 204 points behind the leader and Don Schumacher Racing teammate Ron Capps. This weekend the NHRA Mello Yello Drag Racing Series is at the Texas Motorplex near Dallas for the 32rd annual NHRA FallNationals. In 2016, Johnson entered the event as the No. 3 qualifier but lost in the second round on Sunday former Funny Car and Top Fuel world champion Del Worsham. “It’s been warm there the past few years so we should have good data to go off when we get there,” said Johnson, who was the runner-up for the championship last year after being third the previous two years. MADISON, Ill. (Oct. 1, 2017) – After a first-round loss at Gateway Motorsports Park, Tommy Johnson Jr. sees his chances of winning a Funny Car world championship slipping away. “Realistically this probably killed our chances for a championship, but we can still finish higher in the standings,” said Johnson, who finished second in the NHRA Mello Yello Series standings last year and third the two previous years in Terry and Doug Chandler’s Make-A-Wish Dodge Charger R/T Funny Car. Johnson ranks seventh in points at the midway point of the six-race Countdown to the Championship playoff and trails Don Schumacher Racing teammate and points leader Ron Capps by 204 points. Johnson entered race day qualified ninth with a time of 3.897 seconds at 325.30 mph. His first round opponent was DSR teammate Matt Hagan. Johnson ran a 3.940-second pass (324.90) but Hagan ran a 3.838 (334.73) to go low of the first round. “The team will just continue to work through it, do the best we can, finish as high as we can and more than anything try to prepare ourselves for next year. 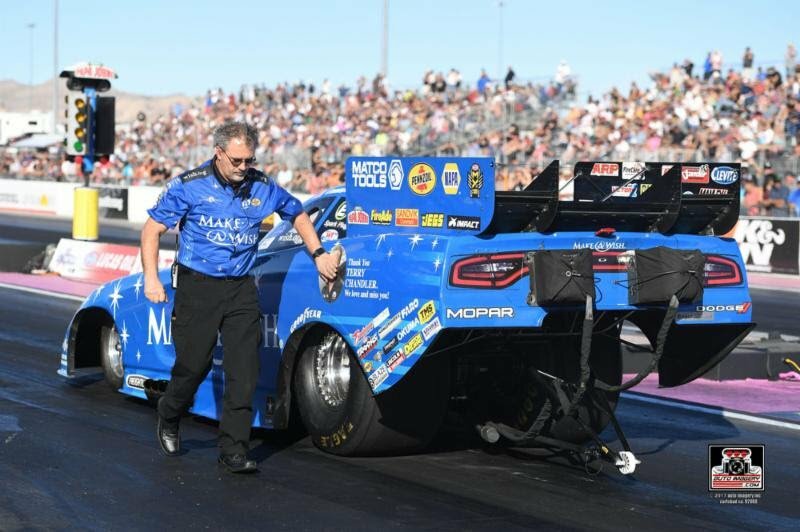 After the early loss on Sunday, Johnson now sits seventh in the points as the NHRA has a weekend off before travel to Dallas for the fourth event of the Countdown to the Championship playoffs.